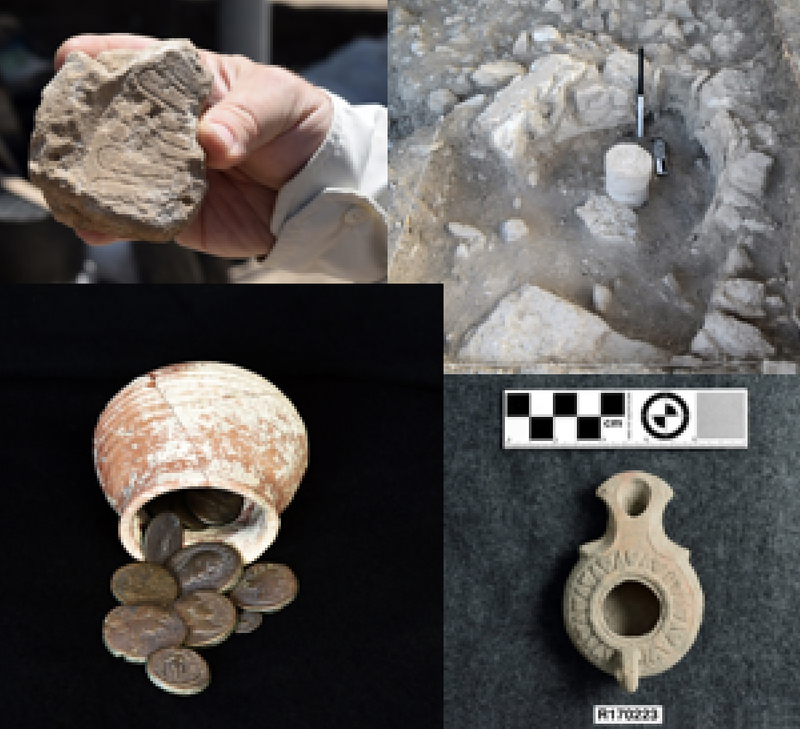 Clockwise from top left: A fragment of a lamp mold, the lamp kiln, a complete lamp from the kiln, the coin hoard that helps date the site. Photos by Steven Meigs. Excavations at the village of Shikhin in Israel are revealing new details of life in an ancient Jewish lamp workshop. Samford University professor James Riley Strange directs the collaborative Shikhin Excavation Project with associate director Mordechai Aviam of Kinneret College’s Institute for Galilean Archaeology. Strange, Aviam, and a team of students and volunteers have worked on the site for six seasons. Their excavations in May and June this year uncovered part of the house and workshop of an oil lamp maker. Although the house was typically simple, with packed earthen floors and, probably, mud plaster on the walls, it held a unique surprise. In an area thought to have been a courtyard, the team discovered a special kiln for firing oil lamps and other small vessels, with two complete, identical oil lamps and a small bowl still inside. Many kilns from various periods have been discovered in Israel­—all of them used to fire jugs, storage jars, cooking pots and other large vessels. These usually measure more than 16 feet in diameter. The kiln in the Shikhin potter’s house, the first of its kind found in Israel, measures less than three feet in diameter, with a central pillar made of stone and brick that supported an upper floor. That floor was pierced with holes to allow the heat from the fire below to bake the fragile vessels. Eleven bronze coins were found in a small pot near the kiln. The latest coin, dating to the middle of the second century A.D., helps date the period of oil lamp production at Shikhin, and allows the excavators to suggest that the potter’s house and the rest of the village was abandoned about that time. Because oil lamps were intended for daily use, they were ubiquitous in houses of the ancient world. In the Roman period, lamps were made in two (upper and lower) stone molds, and the upper one was usually decorated. On the lamps and molds from Shikhin, one commonly sees clusters of grapes, pomegranates, rosettes, tendrils, leaves, and occasionally objects such as vases or amphorae. One of the most beautiful Shikhin molds is decorated with a ring of pomegranates and vines. Another finely made fragment of an oil lamp was decorated with ethrogs: citrus fruits used at the festival of Sukkot or Booths. Four years ago, a Shikhin team discovered a fragment of an oil lamp decorated with a seven-branched menorah with palm fronds on either side. For decades, the design and decoration of the oil lamps has been known from the southern region of Judea following the destruction of the Second Temple (70 A.D.) and the Second Jewish Revolt (135 A.D.), but it is now clear that similar oil lamps were also manufactured in Galilee. At the conclusion of the 2017 excavation season, Strange donated to Samford’s University Library all the printed materials from the Shikhin Excavation Project, covering 2011 through 2017. Strange pointed out that many universities hold important archaeological archives, and said he has always hoped the Shikhin materials, starting with field books and growing to include digital materials, photographs and technical drawings, would be at Samford for future scholarship.